There is no shortage of options to choose from when it comes to selecting a ferry from Greece to Saronic Islands. There are 4 ferry companies with a combined offering of 22 Ferry Routes connecting Piraeus to Poros (Saronic Islands), Aegina to Agistri, Agistri to Aegina, Ermioni to Hydra, Poros (Saronic Islands) & Spetses, Hydra to Poros (Saronic Islands) & Spetses, Poros (Saronic Islands) to Hydra, Spetses & Aegina, Porto Heli to Hydra, Poros (Saronic Islands) & Spetses, Hydra to Poros (Saronic Islands) & Spetses, Spetses to Hydra & Poros (Saronic Islands), Porto Heli to Hydra, Poros (Saronic Islands) & Spetses & Spetses to Hydra & Poros (Saronic Islands). 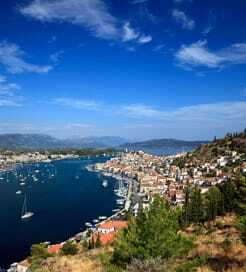 The fastest route between Greece and Saronic Islands is Aegina to Agistri with a crossing duration of around 10 minutes. With so many routes on offer we make it simple by comparing all similar routes in one search so you can quickly find what you are looking for. Greece is a country in Southern Europe with the 11th longest coastline in the world, sharing borders with Albania, Macedonia, Bulgaria and Turkey, and with islands in the Aegean, Ionian and Mediterranean Seas. As one of the world’s most popular tourist destinations, the country’s fabulous beaches, whitewashed homes, historical sites and favourable climate attract huge numbers of visitors to its islands year round, though the majority arrive between April and October. Whether you arrive on the mainland by sea or by air, the majority of islands can only be reached by ferry. With the number of services on offer, as you may expect, Greek ferries are of a high standard and most ferry companies feature a modern and luxurious fleet. All Greek islands are linked to the mainland, some directly, some indirectly and island-hopping is great experience, not to be missed. Due to being a gateway to the islands, the Greek mainland is well connected to Italy across the Adriatic Sea too. 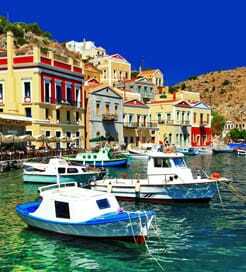 The Saronic Islands are the closest Greek islands from Athens, located over the Argosaronic Gulf in Southern Greece. The islands can be easily accessed from Piraeus by ferry, making them perfect for a day-trip from Athens. Visitors are guaranteed to enjoy natural beauty, historical treasures, unique architecture and a glamorous yet romantic atmosphere on these small heavens, each with a different character waiting for you to explore.